Metapelet a community website | Members area : Get free newsletter from metapelet.co.cc. A new Israeli law that would bind migrant workers in nursing or care-giving professions to their employers is raising alarm amidst human rights groups and legal experts, who say that the law infringes upon the workers’ right to dignity and freedom. 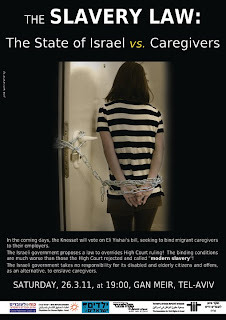 "This law mainly affects women caregivers who come legally to Israel. These caregivers will be able to stay in Israel as long as they work for the employer who brought them into the country, usually an elderly person or a handicapped person," explained Sigal Rozen, from the Hotline for Migrant Workers, a Tel-Aviv based organisation working to promote the rights of undocumented migrant workers and refugees in Israel. "Very often it happens that these (employers) pass away and then the caregivers have to find a new employer. The new law will limit them tremendously in their possibilities to find a new employer," she said. Amendment 21 to the Israel Entry Act – which has become known as the "Slavery Law" – would authorise the Israeli Ministry of Interior to bind migrant caregivers to their employers and to specific sectors of nursing services, limit the number of times a worker can switch employers, and only allow caregivers to work in a certain geographic area inside Israel. Should a foreign worker leave his or her employer because of poor conditions or salary, or violate any of the above provisions, that worker would become an illegal resident that can then be deported. The legislation faced widespread opposition from various groups in Israel and abroad, including an open letter signed by a group of prominent Israeli lawyers, law professors and judges which argued that the law would "wrongfully infringe on the basic rights of migrant workers, by creating and enhancing their dependence on their employers for their legal status, and by limiting their ability to escape from abusive employment conditions." Ninety-one Jewish-American legal experts also sent a letter to Israeli Prime Minister Benjamin Netanyahu and Israeli parliament (Knesset) Speaker Reuven Rivlin in early May, urging them to reconsider the controversial amendment. Despite this, the law was passed by a vote of 26-6 in the Knesset on Monday, May 16. According to the Israeli Ministry of Interior, the new law will ensure that workers don’t abandon their employers while also helping reduce the number of illegal workers in Israel. The government is also said to be concerned with the fact that there is a shortage of caregivers working in some nursing fields and in remote areas of the country. Rozen, however, said that despite the government’s arguments in favour of the law, it contravenes a 2006 Israeli Supreme Court ruling. Indeed, in March 2006, five human rights organisations challenged a similar binding arrangement of migrant workers to their employers in Israel. The Israeli Supreme Court ruled that this arrangement should be repealed since it "violates the dignity and liberty of the foreign workers" and constitutes "a modern form of slavery." Ultimately, the Supreme Court gave the Israeli government six months to cancel the binding policy; it didn’t. "For five years actually, Israel is violating the Supreme Court ruling. What they are doing now is making a law that will go around the Supreme Court ruling and will make the binding policy legal," Rozen said. Rozen added that while the specific details of the new law – how many times a caregiver can switch employers, for instance – have yet to be determined by the Ministry of Interior, another appeal to the Israeli Supreme Court is likely. "We hope that it will be as less limited as possible. But in any case, I assume we will have to address the Supreme Court again the moment we will know exactly what (the law) means," she said. The Association for Civil Rights in Israel (ACRI) estimates that there are presently approximately 55,000 migrant caregivers in Israel, the majority of whom are women. Most come to Israel from Sri Lanka, India, Nepal and the Philippines. According to Ramesh Sharma, the 28-year-old Head Representative of the Caregivers’ Union in Israel, a branch of the Koach Laovdim union ("Power to the Workers" in Hebrew), the "Slavery Law" will have a devastating impact on women caregivers especially. "If you are getting sexually harassed in the employer’s house, what choice do you have? You can just do one thing: leave the employer. The new law will mean that in this case, you either leave the job and leave the country, or continue to be exploited," Sharma told IPS. "A lot of the workers don’t want to say (that they were sexually harassed or abused) because they are ashamed. Even when they are exploited inside the employers’ house, they don’t want to say," he added. Originally from the city of Indore, in the Madhya Pradesh region of India, Sharma has worked as a caregiver in Israel for nearly four years and currently takes care of an elderly man living with Alzheimer’s in Jerusalem. He explained that the major challenges facing migrant caregivers in Israel are long working hours – sometimes 24 hours a day if the employer is severely handicapped – poor living conditions, and sexual harassment or abuse. "(Israeli politicians) claim that they want to improve the conditions but they are not acting to improve the conditions. (This new law is) making it more difficult to stay here. It’s the start of slavery," Sharma said. Major demonstrations were organised in Jerusalem and Tel Aviv over the past few months to demand migrant caregivers’ rights and attempt to draw attention to the impact of the "Slavery Law." Now that the law is passed, however, Sharma said that he wasn’t sure what steps will be taken next. "I was so disappointed," he told IPS. "But I believe that now the workers are forced to speak out and I hope we will go together to ask for our rights." Keep visiting SundarSansar.com - a complete Nepali entertainment portal. Thank you, and hope you enjoyed. KEEP METAPELET.CO.CC LIVE BY VISITING OUR ADVERTISERS. metapelet.sundarsansar can be visited as www.metapelet.co.cc too. VISIT SundarSansar.com A complete Nepali entertainment portal.